We’ve all been denying it and dreading it, but it’s time to come to terms with it: the holidays are here. I don’t know about you folks, but this week and next for me will be a chaotic haze of gift buying, office parties, secret-santaing and dinner partying. So you need to get something. Ideally under $20-$50 and you kind of want to avoid getting everyone the same coffee table book of “Chairs Throughout History”. While thinking about it you grab a beer…and then it hits you. It’s one of my favorite seasons right now…BEER GIFT BOX SEASON! That glorious time of year where breweries decide to make a box set that samples their beer and comes with a beautiful glass. They’re cheap, they’re pretty and they’re tasty! They truly are good gifts for the dinner partying or office partying crowd. The following is a list of some favourites I’ve known of. Speak to your local Boozemonger for information on purchasing/ordering. Of course, prices may vary and I can’t be held responsible if you spoil the gift by opening it and trying it for yourself. This is a really fun set. Comes with four bottles of historic ales (Pine Ale, Heather Ale, Elderberry Ale and Gooseberry Ale) which all, to my surprise the first time I tried it, taste just wonderful. The story behind them is also amazing and listed on the back of the bottle so you can learn something (The Gooseberry Ale was originally brewed by 16th century Scots monks, the Pine Ale was brought over by the Vikings and so on). This is a nice and cheap set which brings out a sort of adventurous spirit in people with the results always being good ones. I strongly suggest picking up this set. To regular readers here, SHUT UP I KNOW HEAR ME OUT. Let’s face it, you’re bound to have some friends, no matter how much you try to pour craft beer down their throats, that are going to like the simple stuff. This pack has three beers with accompanying glasses for each one. Stella Artois, Hoegaardan and Leffe Brune. While I can’t say I’m a huge fan of the first two, I have to acknowledge that people love them and that’s cool. Also, Leffe Brune is truly a wonderful beer and mixes it up a little. While a beer snob would turn his or her nose up to this, it does make an ideal gift for a friend who likes that kind of thing and ESPECIALLY for “mystery gifting” at office parties. It IS practical. I actually bought one of these (The Coffee Porter one) for a Dinner Party I’m going to tonight. Three different packs; one for their Organic, their Tankhouse Ale and their very tasty Coffee Porter. Each beer comes with a glass that will suit the beer (The Coffee Porter comes with a Snifter Glass, for example) and they pack a HUGE punch as a present for a really cheap price. Once again, ideal for office party Secret Santas or dinner parties and the beer is of exceptional quality! And screw it, I may very well buy one or two of these myself. A pretty damn refreshing beer! This pack comes with two beers, the traditional Weissbier and Erdinger’s superb Dunkel as well as a glass that goes well with this style of beer. The beer is tasty and is sure to attract even the beer-haters of the group. And while Weissbiers are considered by a few people to be a better drink in the summer months, I think they are still quite amazing in the winter months. The nice maltiness of the Dunkel will add to the holiday ambience considerably. This is a gift set for the beer lover friend of yours. You remember my post on Trappist Beers, right? Of course you do! 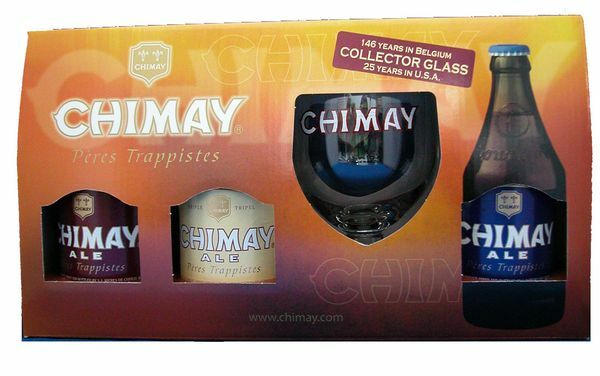 Chimay is one of the seven Trappist breweries in the world and are the most aggressive with their advertising and sales. This set comes with their three famous beers, the blue cap, red cap and white cap, as well as a BEAUTIFUL Abbey Goblet to drink it all down with. Seriously a wonderful set that allows you to try the brews of one of the more famous breweries out there. So there we go! There are more out there, of course so be sure to get down to your booze emporium and check out what’s available! And hey, maybe pick one or two out for yourself while you’re at it. Let’s all try and survive the holidays, folks. Previous Post Who Am I & What Do I Think I’m Doing? FYI, I have nominated you for The Versatile Blogger Award! http://theeternalloop.wordpress.com/2011/12/18/id-like-to-thank-all-the-little-little-little-people-who-live-in-my-head-and-tell-me-to-do-things/ I hope you haven’t already been given one of these, in which case just don’t tell me so I can keep feeling like I’ve accomplished something.